On the morning of December 7, 1941, the Japanese attacked the U.S. Pacific Fleet at Pearl Harbor, Hawaii. In this surprise attack, which would lead America to enter World War II, 6 U.S. ships were sunk and more than a dozen others were damaged. 2,403 American servicemen lost their lives, and another 1,178 were injured. The ship with the most lives lost was the battleship USS Arizona, with 1,177 deaths. Below are excerpted accounts from that day by men who were on the Arizona and experienced its destruction firsthand. The full accounts, and others, can be found in Fold3’s WWII War Diaries collection. Learn more about the attack on Pearl Harbor from Fold3’s World War II collection. Or visit Fold3’s Interactive USS Arizona Memorial to learn more about the servicemen who perished on the Arizona. Thank you, Fold3, for this commemorative post for the 75th anniversary of the attack! My father, P. (Philo) N. (Nelson) K. (Kelley), “Pinky”, Englesby, from Mondovi, WI, was ashore during the attack in Naval Mobile Hospital No. 2, an innovation in naval/military medicine as the second of a new type of, essentially, a MASH unit of movie and TV fame. He was a corpsman or pharmacist’s mate. He spoke sometimes of the unit’s work during and after the attack, and sometime after the attack, he was part of missions to the sunken ships in order to recover the wounded and dead. Barely two weeks before the attack, he had been transferred ashore from the West Virginia to Mobile Hospital No. 2. They were still setting up the hospital when the attack came, and they had to house the patients in the staff barracks. Dad said they treated horribly burned sailors & soldiers. A couple years later, the whole unit got a citation from Admiral Nimitz. Dad later went on to submarine service until his discharge in 11/45…. Anyone else whose father/relative served in naval medicine at PH? Last December in posted comments after a Battle of the Bulge post on Fold3, I ‘met’, so to speak, the daughter of one other sailor from Mobile Hospital No. 2, Thomas Tippin of Kansas. My dad was a corpsman or pharmacist during WWII. He told me he worked at a hospital in Aiea which is no longer there. He never gave me the name of the hospital. I know a new hospital called Tripler was built near Honolulu. My husband was in the Army and we were stationed in Hawaii. He was stationed at Schofield barraks and worked at Wheeler Air Force for 3 years. Our girls got to see history. My dad didn’t talk much about his time in the service. He passed away this past February. My dad’s name was Gilbert Williams. This is the time to remember my mother’s first cousin Hilbert Bell. He was in the engine room of the USS Arizona at the time of the attack. He remains there today with his name on the wall of the memorial. RIP! God bless Hilbert Bell for his sacrifice for our country. I’ve visited the Arizona memorial several times and the oil is still bubbling up from the ship. You can see the outline of the ship just under the water with two gun turrents alongside. It’s a very emotional trip to stand there and read the names on the wall and see the oil slick and especially to know that so many men are entombed there right beneath your feet. Thank you all for your service and God bless all who were there on that day 75 years ago. I’ve also visited the Punchbowl where so many are buried. A beautiful place but solemn place. My dad found the names of several men he served with. Amen! in the early 50s we were friends with a Naval family living behind us in Arlington. My father told me that the officer had been flying a patrol plane that morning without any ammunition. He was flying close to the water when a Zero attacked them, but misjudged the altitude and flew straight into the sea. He and his gunner got credit for half a plane each without firing a shot. In 1989, while serving in the Army Nurse Corp in Hawaii, a group of us took a tour of the USS Arizona. For me, it was such a sacred and deeply moving experience. The lives that were entombed in Pearl Harbor on that fateful day 75 years ago, along with the many other service men and women who lived through the attack, represent the best of America. Their courage, honor, duty and sacrifice should never be forgotten. May God bless each one, and their surviving loved ones, many of whom are still alive today. Thank you. My father, James Woodrow Eskew, his brother-in-law, Ray Berry came to Hawaii to help after the attack. Dad said he worked on the USS Arizona to see if it could be repaired. My father Patrick Henry Arnold, FC/ 2,was aboard the destroyer USS Selfridge DD357 during the attack. He and another fire control man, FC/1 Fenwick, returned fire with a fifty caliber machine gun until it got so hot it almost melted. He said that they probably didn’t hit any planes, but they gave it their best effort, along with every man aboard ship. He was grateful for the hot coffee and soup brought up from the kitchen. After the attack was over, the Selfridge immediately sped out to sea to search for and destroy the enemy. He was a “mustang” who attained the rank of Commander and stayed on active duty for thirty years. He said that Fenwick was “the bravest man he knew,” but I think my Dad was too! Absolutely, your Dad was/is a HERO. God bless him, Mr. Fenwick and every American and American Japanese who fought and help win World War II. Oh, and God bless you and our new President Elect. We must support this new administration. Thanks go out to the people at Fold3 for sharing this great tribute to the men who died at Pearl Harbor! Several years ago, there was a movie (I believe that it was called “Pearl Harbor”), and because of it, I saw a glimpse of the chaos that following the bombing. Not only the men who were wounded and dying suffered. The women nurses who tried so hard to take care of the wounded should be remembered, too. Lets not forget the USS Utah which is also a memorial at Pearl Harbor. It was sunk on Dec 7 and still there with some of it’s crew. Thank you. A long time friend lost his father when the Utah sank. My cousin, James Bounds, was next to the last survivor to be rescued from the capsized USS Oklahoma. There were 33 men who were rescued after being submerged for up to 36 hours in water filled with oil. He has been featured on several history episodes about the ship. He continued to serve and retired 30 years later. After that he volunteered at the VA hospital in San Diego. I am so proud of him and tell everyone his story when I get a chance. My father Pvt. Robert L. Perkins was Stationed at Schofield Barracks when the Japs attacked. 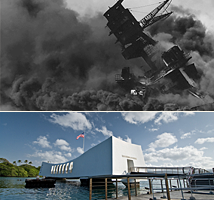 I will always remember Dec. 7, 1941. The gratitude that should be bestowed on that “Greatest Generation” can’t be over stated. And as those that started this nation while signing the Declaration of Independence came to realize defending a new and unique idea in the world then and one that comes around too often: “And for the support of this Declaration with a firm reliance on the protection of divine providence, we mutually pledge to each other our lives, our fortunes, and our sacred honor.” We honor those that served as a part of that generation as well as those that followed in their footsteps in the generations that followed. We hoped that we could always live up to those ideals with the same spirit and dedication. Sorry, I should have “quoted” T. Jefferson in my comment. BRAVO-ZULU ! May we ALL remember all of those who have chose to put our COUNTRY first for it’s sake and our families, loved ones, and our way of life In this “Blessed Land’. neighbors across the street for the loss of their son Eugene Rowe, a crew member on the Arizona. One of the many young man and women that were never able to reach their full potential. “Rest in peace Gene”. William Merrell, You are so very right in your Quote of Thomas Jefferson. May the Trump administration restore the God given rights and constitutional guarantee’s our forefathers envisioned. GOD BLESS AMERICA. I visited the Arizona memorial in 1969 after graduating high school.. I am sure it has happened to other but I felt the presence of all those lost that day. Their poor souls will be forever trapped in the Arizona memorial but perhaps they get solace from all the people who come to honor them. My father Vernon L Davis was on the repair ship USS Medusa moored next to the Curtis which sustained a torpedo attack. For years my Father couldn’t talk about what he saw….it wasn’t until we were adults did he talk about it. He has long passed away but all of us will never forget his service and the sacrifice the men and women made that day. Thanks for the stories. I knew two men at Pearl Harbor. One was on the Oklahoma and saw the planes come in. He was a bugler and said to he superior officer that morning at reveley that those planes did not look like ours. The officeir said to just shut up and blown your bugle. The other seaman was a seaman on the Cunyham. He had been invited to a Xmas party on the Arizona the night before, but had to decline in order to go into town and get Xmas presents for his folks. Once the attack started he and his crew had to take a boat loaded with a propeller screw for the Cunyham (I think) and as he was running it across the harbor the planes were straffing his boat. He also had an appendicitis attack while the attack was going on. Both guys were great guys and I worked with them for many years, even though I was a young guy at the time. My late Aunt Helen Mae’s boyfriend, Frank Cooper, was killed in action at Hickman Field. Frank was also best friend of my late Uncle Bill who was serving in the Army Air Corp at the time. Where in hell did all the other ships go before the attack ??????? A Tragedy which must never be forgotten. RIP all those that lost their lives in this barbaric act. December 7 is such a tragic day. PBS here in Detroit but I assume the videos are available showed the USS Oklahoma capsizing and the theory is a mini sub was in the bay and launched a torpedo at it. I think they tried to tow it to California but it capsized on the journey. They also showed the USS Arizona. You cannot dive on it as it is sacred ground but they sent a camera into the Arizona and the first deck appears coral encrusted, but in the second or third deck down, there is no oxygen and you see an officer’s hat and his coat hanging on a hangar just as it was 75 years ago. Very eerie but a tribute to the brave men of the ship. During the bombing of Pearl HArbor and surrounding areas, we lost many men and women from all Services and ranks as well as civilians. the Arizona memorial entombs not only those who never woke up to battle but as a tribute to all: Military and Civilian who lost their lives on that horrible day of infamy in our history. It was my honor to attend many of the ceremonies recognizing these service members and civilians with “pomp and Circumstance” during the week in Honolulu. Attending with the Daughters of the American Revolution from Las Vegas, Nevada, I can tell you I was humbled by the honor to recognize survivors of the USS Nevada, at the memorial site at Hospital Point at Pearl Harbor. May God Bless all our troop and may we never forget lol hat they have done and still do for us. Amen. My best friend, Clarence Wayne “Chuck” Otterman was a gunner’s mate on the ARIZONA. When “abandon ship” was called, he swam to Ford Island, grabbed a motorboat, and made several trips back and forth rescuing his shipmates. He was to receive the Navy Cross, but he turned it down, saying “I was just doing my duty.” He served out the war on USS MURRAY (a destroyer). He saw some pretty hot action. When he was discharged, he enlisted in the Army, and retired out of there as a command sergeant major of air defense artillery — then he became a policeman and worked his way up to Chief of Police. His life was one of service. My dad was Lawrence TIndell. he was a radioman on one of the ships that landed right before this one. He lost a lot of friends, God bless all of the men and woman that served our country…. I have an uncle who survived the attack that day, his name is Joseph Ernest Trujillo and he was assigned to the USS Balch. He was ashore to attend gunnery school when the attack occurred. He survived the attack at Pearl Harbor and was able to put back to sea aboard the USS Balch a few days later after returning she returned to Pearl from being out to sea . He remained in the Navy and retired as a Chief Yeoman after 20 years of honorable and faithful service. Thank you Uncle Ernie and all your fellow service men and women.. I didn’t have any relatives at Pearl Harbor but I still understand the sacrifice of the dead and wounded. “May the dead have not died in vain” -Abraham Lincoln. AWAKEN THE SLEEPING GIANT AND SEE WHAT HAPPENS. My Great Grand Father served on the USS Colorado in ww2. Amm3c Clyde Shuttlesworth was his name and rank. He passed away in 1994 at age 73. I wish I would’ve got to meet him. Thank you to all those who sacrificed their lives for my freedom today. Thank you to not only those that have lost their lives, but also to those who are still here and to their families. I pray and truly believe that there is a special place in heaven for you all. Thank you again. May God Bless You. My Aunt Marion Emmons served as an Army Nurse during the bombing of Pearl Harbor on December 7, 1941. My grandfather was on the Arizona that day. I didn’t really know home well and he never talked about it. He did give an interview for a local paper and told me a bit when I was 13. Apparently he was stationed below deck and wanted to smoke a cigarette so he traded posts with a buddy so he could smoke. That was when they were attacked. He then swam to Ford Island and helped get wounded to a hospital. His name was Jack Lindsey and was a Seaman First Class. If anyone knew or heard of him I would love to chat. My mother met her Navy husband in Honolulu in 1940 ( 2nd marriage) and was working there when Pearl was bombed. My step-father was killed on the Utah. My grandfather signed on to work in the ship yards in 1942. Although not the USS Arizona, my wife’s great uncle, 23 year old Leon Paul Arickx, was below deck on the USS Oklahoma when it capsized, and was never seen again. He is memorialized with a small column at the Tablets of the Missing at Honolulu Memorial which bears his name and rank. The family never had real closure on his final fate since he was never found.